Tony Bates, the former Cisco Systems (s csco) executive, has had better days. For the past 24 hours, he has been coordinating the efforts to bring one of the world’s largest communication networks back up: Skype. Bates, who recently took over as Skype’s CEO, spoke to me about the service’s downtime and gave me a status report. 16.5 million of 25 million concurrent users are back online, even though you might be seeing a lower number in your desktop client. Users in Europe and on the U.S. East Coast are fully restored. The IM, video and audio services are back up. The Group Video services and offline IM capabilities are not going to be working for some time, mostly because Skype is using those servers as supernodes. The company will issue an update later today. Bates said the implementation of the new supernodes isn’t going to have a material cost for the company. “We have a fair idea as to what happened, but we are going to do a full postmortem,” said Bates. A handful of Windows clients failed and set off a chain reaction that brought down Skype. “One of the biggest lessons from this is how we do communications in the future,” he said. Skype always has had free calls to us phone and mobil numbers. This is appropriate since the quality is often bad and free is the right price. Since you have never been able to fix quality, set the zero price again. Do you do any thing about feed backs. Why your organisation do not give simple and straight forward answer to question like “How to contact skype by phone or e.mail” Am i likely to get answer of my feed backs to skype? I would like to speak to you by skype or any other means. Funny how Brit CEOs with the first name “Tony” are so good at saying “We’re Sorry”. I can’t stop thinking of the SouthPark episodes where Tony Hayward (former CEO BP) kept saying it, in funny and different poses. Gosh, Skype Users…We’re Sorry….We’re So-rry. I’m not sure I understand why it has to be an either/or thing. Is this not a problem you can solve by firing up additional nodes with a cloud provider? I think the whole issue was caused by the whole “pending message” issue. it grew out of control. I had been having more and more pending messages for people I was actively chatting with. It just kept getting worse leading up to the outage. I think Amazon and their AWS service is an example for both where even they went down quite a bit in their early days for both services….however, I personally saw how they used those experiences as learning and turned around the ship as the gold standard for both online shopping with customer experience and cloud infrastructure. and it shows me as offline. I was thinking about the same issue as Skype is the last of secured communication. Thanks for the update. I’m curious about the statement “A handful of Windows clients failed and set off a chain reaction that brought down Skype.” Did he say anything further about that? It reminds me a bit of the 2007 outage and the issue then with churn among the supernodes related to some Microsoft updates. Would be curious to learn more. 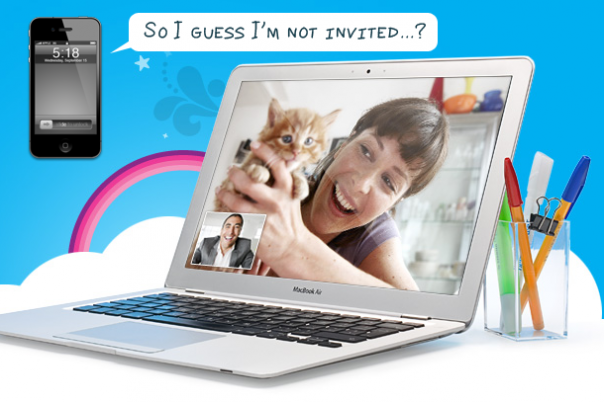 I am surprised that Skype has 8.1 million paying customers. After 4 years of using the free service I recently decided to add Skype credit via PayPal. Within 4 hours, whilst I was logged in and online via the ‘secure’ client, my Â£20 credit was being syphoned off by a hacker making calls to Sri Lanka – all recorded neatly in the Call History tab. Fortunately, I noticed this and was quickly able to change my password from the settings and log out to prevent the hacker changing the primary email account to one of his choice – thus locking me out of my own account. As a systems engineer I keep my computers malware and virus free, do not login to public computers and employ a strong password policy for all online accounts. I was puzzled as to how my account had been compromised so quickly. After Googling Skype account hacking I was amazed to see the hundreds of similar reports from users who had had their accounts hacked and Skype credit stolen. and extract usernames and passwords containing credit. There were even downloadable Skype hacking tools on offer. C) Implied that most likely my computer had been compromised yet then acknowledged the usage of Skype hacking tools aimed at their database. whereby a payment request is automatically submitted via your chosen payment provider when your credit approaches Â£0.05. Some unfortunate victims have been powerless to stop these requests being approved and have lost both their existing balance plus top up credit. back in again! This is the extent of their account security. misery users are exposed to. The Skype executives shield themselves cleverly behind a layer of support agents who are forced to regurgitate the companies policies when confronted by angry victims of account abuse. Until Skype come clean about their security issues and face the music then why would anyone use anything more than the free service? I can only imagine the ensuing financial chaos that corporate account hacking will bring should Skype become more mainstream for businesses – and the excitement of that prospect for existing Skype hackers. is this a hatred or a hidden advert ? anyway, it’s full of nonsense. tools to hack into skype database ? http://www.youtube.com/watch?v=C4jGa7HvTz0 – link to claimed demo of Skype hacking tool. Lots of other similar tools listed in sidebar. It was a personal story, but possibly relevant to this post and to Skype users. The personal attack in response was annoying and unwarranted. Just curious. What does Skype mean by ‘users in Europe and on the US east coast’. Does this mean people connecting to Skype at that moment from an IP address physically located in one of those places? Does it mean customers who indicated their home location was one of those places when they signed up? What does geography have to do with it? If I’m in Asia, with a European home address but connected to a VPN through San Francisco, is my service restored…? When Skype went down I was helping a friend more his domain over to Google Apps. My friend and I live on different coasts, usually use Skype to communicate. Skype’s crash reminded me to introduce him to Google Voice. He loved the voicemail transcription, and how well it integrated with Gmail and other Google resources. Now he’ll use GV for his standard voicemail, and because he will check this more regularly than he will communicate over Skype, his move away from Skype has begun. Skype has been late to Android – where is their mobile video feature, months after Android phones came out with front cameras? For business users Skype’s focus on enterprise is a disaster only made more obvious by yesterday’s failure. They could have offered a hosted PBX services for organizations of 5-100 people and it would have taken off quickly. But they focused on more conservative enterprise customers who have more pricing power with carriers, leaving the door open for Google to add this to Apps and freeze Skype out a market even larger than the enterprise market. Sad to see a great service be so neglected. I personally made the change from telco provided voice (old phone, other than cell), to All Skype (actual Skype phones and desktop clients) in 2007. So, they have been fairly reliable as a $3.00/mo USD solution, no 911 services, and mostly flexible, portable anywhere, and a good value. I also have Google Voice and the IM phone service, which I give out as a business number. But my Skypeout number is now very much my personal number. A 24+ hour outage is pretty outrageous when the service is your phonebook, telephone, IM, and all that. We share screens with clients, and use the free calling with dozens of clients around the globe for sales and support. Not bad eh? I try to keep in this in mind, as the company I consult for is going to war in a landmark antitrust case in the EDI VAN industry: that Skype has built a competitive infrastructure and a very enhanced service over their competition, the incumbent phone companies. So I give them a little leeway in screwing up once or twice. Just as our company is paving the way for open access via API to the legacy EDI global trading grid, Skype is forging a new paradigm in telecom and converged services. Tolerance for an innovator throwing over 60 years of an assumed beneficial monopoly (AT&T telco etc.) is counseled here. We ask the same in our industry where the dominant players occupy such a firm and entrenched position , that not one independent has deigned to offer anything new in decades. However, outages are not at issue in our case, it is fair access to the leviathan EDI VAN networks for peer message routing. I trust that Skype will do a proper postmortem and do what they must to keep a BIG telco of the New Era running at acceptable service levels. Do you mean to tell me it takes an outage for the CEO to realize how many people are using their service and how they use it in different ways? Wow – you would think he would be keeping tabs on that before hand so he could possibly market new services and/or anticipate trends, etc. Seems to be clueless. No. He has always realized, but the out poor of emotional responses to this event is what was amazing to him, and that is what he was referring to. The CEO just moved over from Cisco and is entirely clueless about the consumer internet. As did the CTO apparently. As pervasive as Skype is amongst the geek set, I was surprised to see that #Skype wasn’t (as far as I can see) a trending topic on Twitter, even though is suffered a complete global outage. I would be more concerned about that if I was them. #Festivus and #howtopissyourgirloff apparently resonate with the internet set far more than Skype. I really hate it when they make such statements. This pretty much suggest that they don’t know their users. How awful!. PS: I don’t use Skype. Skype now has enough commercial revenues, that they can afford their own set of supernodes in the mix that are functional all the time rather than on pure reliance on P2P infrastructure. That will increase costs, but they need to have a minimum survivable infrastructure that does not rely on the kindness of users and strangers to keep the supernodes up. At the very minimum they could have nodes at the edges waiting to be kicked in rather than repurposing their production machines to act as supernodes in an emergency. and the nsa’s new listening posts? nicely installed?